With the death toll substantially lower than originally expected, officials discontinued the active search for bodies today in Louisiana. Officials said the final death toll was 972 – substantially smaller than the 10,000 victims some feared. The death toll in Mississippi remained at 221, according to the authorities in the state. Louisiana officials said more searches would be conducted by a private company hired by the state if someone reported seeing a body. “There might still be bodies found. For instance, if a house was locked and nobody able to go into it”, said a spokesman with the state’s Department of Health and Hospitals. 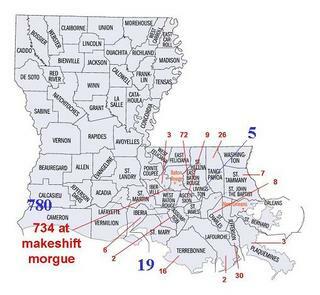 The Louisiana Hurricane Katrina Death toll per parish. Hardest hit New Orleans and St. Bernard parishes sent their dead to the makeshift morgue near Baton Rouge. The blue digits are the updates from the previous count. Last week the death toll was at 923 deaths for Louisiana so bodies continue to be collected in the disaster area. 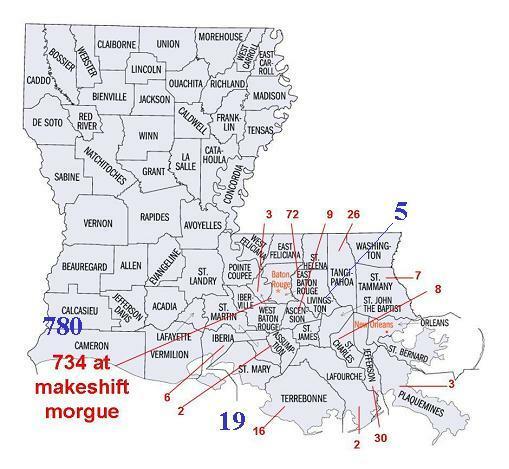 At this time, state officials, working in conjunction with coroners from local parishes, have recovered 972 bodies. This is an increase from 964 recovered bodies on Oct. 3, 2005. State, federal and local teams have ended the official search phase of the body recovery mission. State-supported recovery teams are available to assist should a body be found that must be recovered. Most of those identified had pre-existing conditions and were from a hospital or nursing home. There were very few children killed in the disaster. Dr. Louis Cataldie, with the Louisiana State Health and Hospital Department, said only six or seven of the bodies at the St. Gabriel morgue were murder victims, primarily from New Orleans. The casualty count also includes those who may have died before the disaster and who’s bodies were being held in a morgue. Many families are having a very difficult time recovering their deceased family member. Dr. Louis Cataldie, from the Louisiana Health and Hospitals Department, said through a spokesman that he was concerned about the flow of information from the morgue. At a news conference here last week, he acknowledged that many families were suffering. “These are horrible times.” Cataldie acknowledged that identifying and releasing bodies has been painfully slow. Of the nearly 800 bodies taken to the morgue, he said, just 32 have been identified positively and 340 have been identified tentatively.